A lot of the jobs I’ve been working on lately tend to be a good ways from the house or shop where I keep my tools. A rolling tool bag has been the perfect solution for the problem of carrying all my tools from A to B. Rather than toting all of my different hand tools and gear piece by piece, this rolling bag allows me to stuff nearly all of my goods into one single container and roll on. 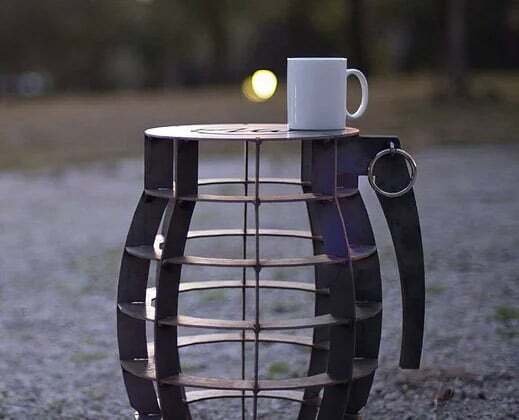 If you’re interested in owning your own, check out the following link: 22 in. 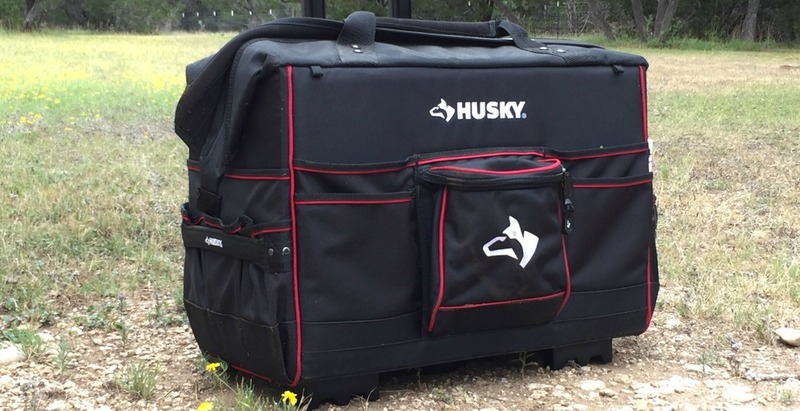 Husky Pro Grade Rolling Tote. The bag looks as though it was designed with the technician in mind as can be seen by the numerous small and medium size pockets on the inside. During a recent garage window replacement job at my parents place, I took only one piece of cargo in the back of my truck; this Husky rolling tool bag. After the bag was fully packed, I noticed a nice padded pocket on the front inside cover that is perfect for fitting my laptop. I’m not sure if this was the intention of the wide front pocket but it is nice and perfect for carrying the laptop outside of the “common area” of the bag where it could get damaged by the other tools knocking around. The fabric is very thick and durable feeling. All of the edges of the pockets have nylon fabric reinforcements to keep the fabric from fraying which I thought was a nice touch. The designers also featured 2 small size zipper pouches on the inside that would work well for small fasteners, a set of keys, or even a phone or wallet. Another nice touch to the inside are two tape measure anchors as you can see below. I really like this feature since I am reaching for a tape so often and it’s nice to have it right on top and not get lost in the mix. The quality in construction carries through on the outside of this rolling bag as well. On the outside, Husky gives you three medium pockets on both ends and five medium-large pockets on the front of the unit with the same edge reinforcement you find on the inside. On the back of the unit you can find a nicely placed transparent pouch for a name tag in case someone else finds your bag. Speaking of reinforcements, Husky also reinforced the fabric around the four corners of the bag with something that looks and feels very much like 550lb parachord. This stuff feels super strong and like it would do well to prevent the fabric from tearing around the corners of the steel box structure under the fabric. Water resistant – What’s up with that? As soon as I read this on the bag I thought only one thing – “I’m gonna get it wet!” After hosing this thing down and getting some strange looks from my husband, I was pretty impressed to see there was no water inside the bag. This feature is great if you’re on a site and it starts to rain or the bag catches some over spray, but I also like that I can rinse it off quickly when it gets dirty without having to empty all the contents inside. The main zipper is pretty large and is covered with a neoprene type material that is found in wet suits and life vests. Once the unit is zipped up, just fold the flap over the zipper for some added protection. While it is not water proof it will certainly keep the rain out while it’s riding in the back of a truck during a rain storm. The plastic body on the back of the bag that makes up the handle frame has some really smooth geometry as well. 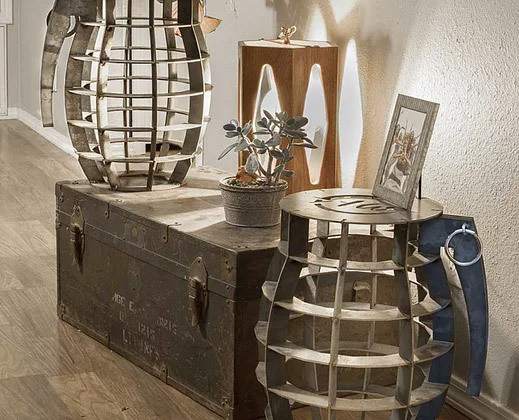 This is nice if you are going to be hoisting this bag up finished staircases. All of the edges are either radiused or tapered to avoid damaging flooring material. When it comes to lifting this mammoth of a tool bag, Husky provided some very strong feeling straps on the sides of the unit. The lifting straps are nice and low and help the unit to “lean” into your body when your carring it or lifting it into the back of a truck. This bag covers a really wide variety of consumers. I’m a DIYer/builder and I find that is works really well for the type of work I get into when I need to grab some select tools and take them somewhere outside of the shop. I think the ones who may benefit the most from this product would be electricians, cable installers, field technicians/engineers, RC enthusiast, mechanics, mobile seamstresses, mobile dog groomers, cleaning crews, and gardeners.